Like a drunken Mardi Gras parade, the history of New Orleans lurches from electrifying highs to heart-rending lows. Through it all, good drink was a constant—especially rum. The victory at the Battle of New Orleans was sealed with a barrel of rum, and a half-hearted implementation of Prohibition a century later certainly didn’t dampen the city’s spirits. 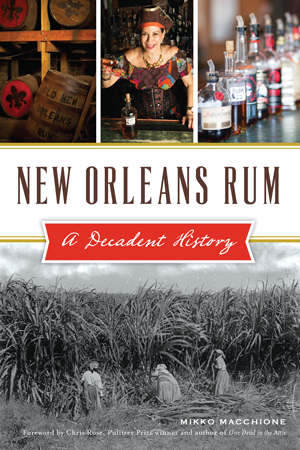 From priests making tafia to modern delights like Old New Orleans and Bayou, rum has always been an integral part of the funky, sultry, crazy story of the Crescent City. Longtime historian and writer Mikko Macchione presents a witty and informative history of the city and its love affair with the sweetest of liquors. Mix yourself a Hurricane and see New Orleans through a glass of rum.